One of the hallmarks of any festive occasion is the popping of Champagne corks. There is something about this sparkling wine from France that has always been associated with good times and living the high life. For brides and grooms trying to decide how to include Champagne in their own celebration, here is a basic primer. The first thing that many people do not realize is that true Champagne comes only from the region of France of the same name. Anything else is a sparkling wine, but is not truly Champagne. Champagne was created hundreds of years ago in France, and gets its bubbly nature from a process of second fermentation. It was first enjoyed by royalty, thus the association of Champagne with being luxurious. There is nothing quite like sipping a fine glass of the bubbly, while all decked out in a fabulous bridal gown and crystal bridal jewelry. Between the Champagne and the glamorous crystal bridal jewelry, you are sure to feel like royalty yourself, at least for one day. There are a number of famous French Champagne houses. Some of the more famous include: Taittinger, Moet et Chandon, Veuve Clicquot, and Perrier-Jouet, to name a few. Of course when choosing a top bottle of Champagne, you can expect to pay top dollar; prices start at around $40 for 750ml and can run into well over $500 a bottle! If you are planning to serve a lot of Champagne at your wedding, look into buying it by the case; you can usually find volume discounts. Champagne is typically produced using a blend of white Chardonnay grapes and black Pinot Noir grapes (though other varieties, like Pinot Meunier are also used). Rose Champagne has a little bit of red wine added to create its signature pink color. That could be a lovely choice for a pink themed wedding celebration. Another thing to know about Champagne is how sweet is is. The different types (from driest, or least sweet) are: brut natural, extra brut, brut, extra sec, sec, demi-sec, and doux, the sweetest. The difference depends on how much sugar is added. The earlier Champagnes tended to be quite sweet, but today the most popular is brut. If you are unsure about which to choose, that is a safe bet. Many people find the sweeter Champagnes to be too cloying. Most Champagnes are non-vintage, meaning that they were made by combining grapes from different years. Vintage Champagne, on the other hand, is created when at least 85% of the grapes used are from the same year. This is done in cases of a particularly fine harvest, and results in a top quality Champagne. Vintage Champagne will be considerably more costly than non-vintage. The most special Champagnes of all are the prestige cuvÃ©e, which are the top of the line creations from each brand. Some of the best known are Dom Perignon by Moet et Chandon and Cristal by Louis Roederer. If money is no object and you truly want to impress your guests, by all means, pop the cork on one of these premier bottles. For many couples, money does matter, and in that case, there are some other options available besides Champagne. The least expensive is to serve a sparkling wine from California instead. A mid-range option is to serve a good bottle of the Italian sparkling wine, Prosecco. This is a nice option if you want to serve your guests a special treat without spending too much. The Champagne toast is one of the highlights of any wedding. Make yours extra special by carefully choosing a wonderful Champagne to serve your guests. Then pop the cork, and let the celebration begin! Let us know if you need assistance in any area of planning your wedding.Take advantage of Bridget’s experience helping clients select jewelry and accessories. Crystal bridal jewelry will make you feel like royalty on your wedding day! 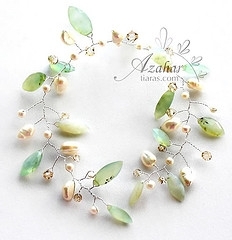 This entry was posted in Crystal Glitz and tagged hair, headband,, jewelry, tiara, wedding on July 30, 2009 by admin.